Henry Harland and Daniel Blair. In the partnerships of Harland & Bliss with H. Bliss in 1830 and then Harland & Blair with Daniel Blair 1830-1834. 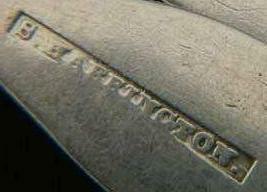 Also used the mark of his father, Thomas Harland. Silversmith and watchmaker. 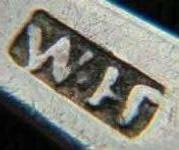 Harland mark also used by son Henry. Was in the partnership of Stauffer & Harley 1852-1861. Was in the partnership of Prevear & Harrington with Edward Prevear 1841-1842. William Harris and Henry Burrill Stanwood. George B. Foster was a member of the firm 1842-1847, changing the name to Harris, Stanwood & Co. during this period. A precursor to Shreve, Crump & Low Co. In the partnership of Harris & Wilcox c. 1844-1852. A partnership of Judah Hart and Charles Brewer. Judah Hart and Alvan Wilcox. Was in the partnerships of Hart & Hart with his brother Judah Hart c. 1810-1816. Hart & Brewer with Charles Brewer 1800-1803. Hart & Bliss with Jonathan Bliss 1803-1804. Hart & Wilcox with Alvan Wilcox 1805-1807. Hart & Hart with brother Eliphaz Hart c. 1810-1816. Was a partner in the firm of Hart & Smith with John Smith 1814-1816. Makers of some sterling hollow-ware; mostly silverplate. William Harting and Adolph Joseph Kroesing. Daniel Hartman and William Phillips. Founded by Henry W. Harvey and Samuel Otis. Makers of sterling flatware and souvenir spoons and gold masonic and fraternal jewelry. Jewelers; made small sterling novelty items. Was in the partnership of W.E. & R. Haskins with Ralph Haskins 1829-1830. Founded by John Hasselbring c. 1890 as makers of sterling holloware and novelties. Incorporated in 1911 as the Hasselbring Mfg. 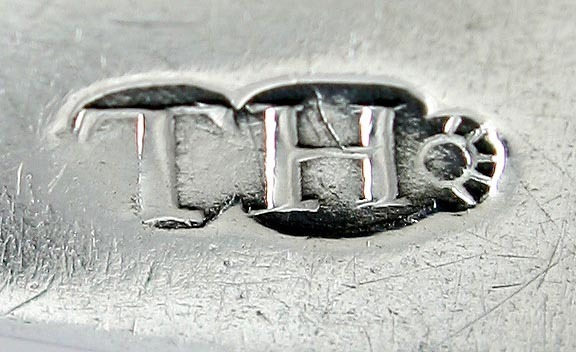 Co. and purchased by the Crown Silver c. 1955.Co. Was in partnership with his brother Joshua Hastings under the name of D.B. & J. Hastings 1855-1891. HavOneBrand name of cigarette cases made by the Elgin American Mfg. Co.
beginning in the 1880s. By 1913, Hawkes was making their own mounts. A partnership between Horace Harlow Hawley, George Leach and Almon Leach.